The Mizuno JPX 900 Hot Metal iron set is designed to take players to the next level with increased distance and forgiveness with all of the technology that it offers. First, the club heads are strong and lightweight thanks to the Chromoly 4140M composition. Next, Mizuno’s Power Frame Technology distributes weight into the corners of the club, allowing maximum forgiveness on the occasional poor shot. Finally, the JPX 900 Hot Metal irons are equipped with triple cut soles that give players remarkable versatility and workability all over the course. Length listed is that of the 6 iron. Got fit for irons and these were simply the best for me. 10-15 yards further than my old irons, and much more affordable. I'm back enjoying golf again. Have golfed 5 rounds in the 70's this season. 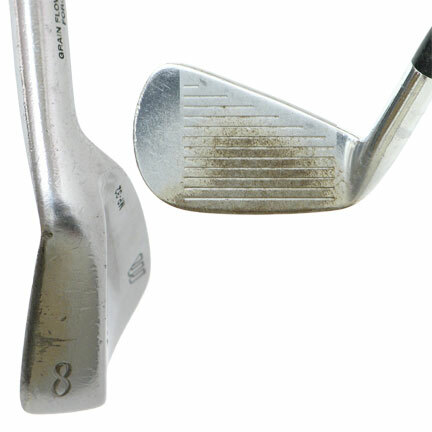 Before these irons, I only had two rounds in the 70's my whole life! Yes I changed my swing a little, but these irons are just excellence! Nothing feels like a Mizuno. I am 62 and 5'8" tall. I recently purchased these clubs as I was not as sharp as i used to be with blades. Nothing feels like a Mizuno as they say. And all I can say is Wow. Even thou they are not forged they have tremendous feedback. And the ball flight is penetrating. Also they are so easy to control. The spin in the scoring irons is what suprised me. You would think with a Game improvment iron they would not hold greens as well...Wrong.. they do.. very im pressed. I recently went in for an iron fitting and these irons were the best for me by a long shot. They look great, feel really good and are very forgiving. They give me plenty of feedback without being harsh. I have hit quite a few off the toe and they still go straight and don't lose the distance that most other clubs do for me. I played my first 18 with them the other day and shot one of my best scores in a long time, a 75! I hit 14 greens in regulation and the 4 that didn't were very close. my favorite part was the flexibility with these!They offer a ton of different shafts and grips with a $0 upcharge. They sell the custom ones right here on Global Golf for a great price so see for yourself. Highly recommended! These irons look amazing and play just as well. Long and forgiving. The Mizuno JPX 900 Hot Metal iron set is made with a strong Chromoly 4140M steel. 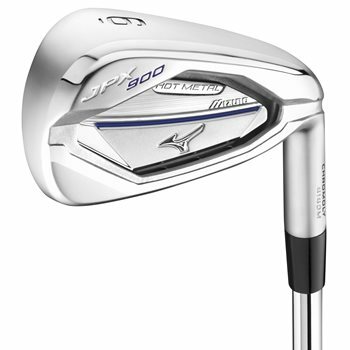 The material gives the iron strength and produces the hottest face in a Mizuno iron ever. Ball speed is maximized with an ultra-thin face and re-engineered CORTECH multi-thickness design. The Power Frame on the Mizuno JPX 900 Hot Metal iron set pushes more mass to the perimeter of the club head to give forgiveness. Using Mizuno’s Harmonic Impact Technology gives the JPX 900 Hot Metals irons a solid sound at impact. Unitized Cup Face Geometry pairs with the Power Frame to create a large sweet spot. Unitized Cup Face geometry also produces a deeper, more forgiving CG location.